Umami -- it is that pleasant savory taste that people have struggled to describe for thousands of years. The fifth taste, as it is known, is often present in fermented foods and it is what makes Treeline cheese so amazing. You will know it as soon as you taste this new cashew-based vegan cheese. Treeline cheese is being produced by The Gardener Cheese Company in Kingston, NY and is the first soft vegan French-style nut cheese to hit the market. 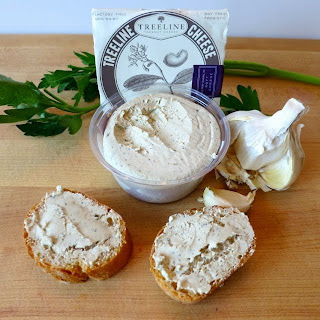 In the same way that Daiya changed the definition of vegan shredded cheese and Dr. Cow redefined hard vegan cheese, Treeline will go down in history for producing the first amazingly delicious soft vegan cheese. 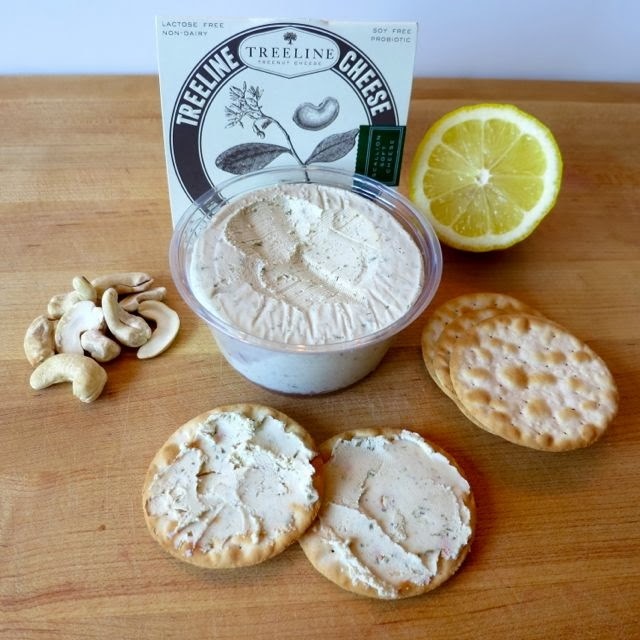 Treeline soft cheese comes in two flavors -- Herb-Garlic and Scallion. Although the manufacturing process is proprietary, I can share that the cheese is made by culturing cashews in the same way that dairy cheese is made. It is produced in a dedicated, all vegan facility in a blighted but recovering part of downtown Kingston, NY. And so far, everyone working for the company is vegan. Who is behind this? That's what I was wondering. His name is Michael Schwarz and he is a former intellectual property lawyer. He started Treeline because he feels that providing alternatives to dairy products is an essential element of the animal rights cause. He feels it isn't enough to tell people they shouldn't consume dairy. The animal rights movement has to provide them with an alternative that tastes good. His animal rights views have their origin in South Africa. He grew up in the apartheid era. His parents were active in anti-apartheid politics and instilled in him the belief that he didn't have to go along with things that were wrong. When you see an injustice, you have to do something about it. The way that animal-based foods are produced is unjust, just as apartheid was unjust. 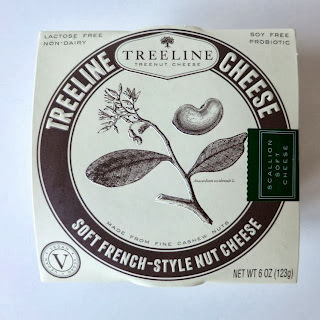 And so Treeline cheese was born. I first tried the Herb-Garlic flavor on a baguette. It's soft texture coupled with the umami flavor just explodes in your mouth and makes you want more. This is the perfect cheese to pair with a glass of wine. Then I tried the Scallion flavor on Carr's crackers. 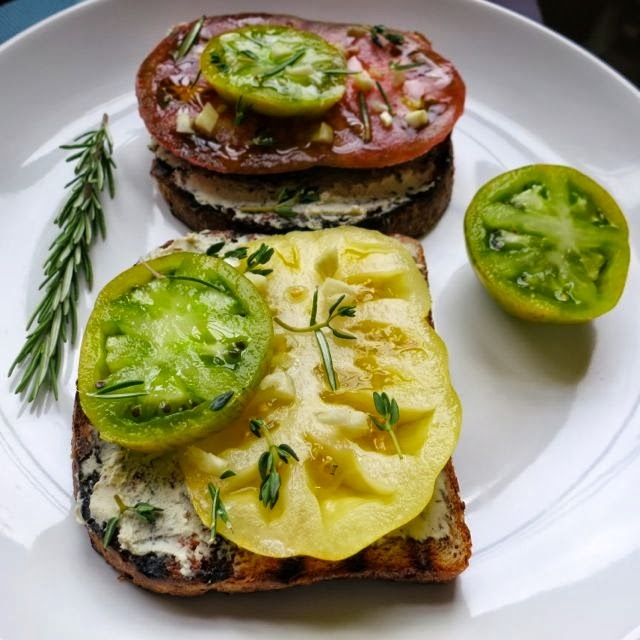 The herbs are subtle, but tasty, and again, the texture is absolutely perfect. The Carr's crackers are great with this cheese because they really let the flavor shine through. 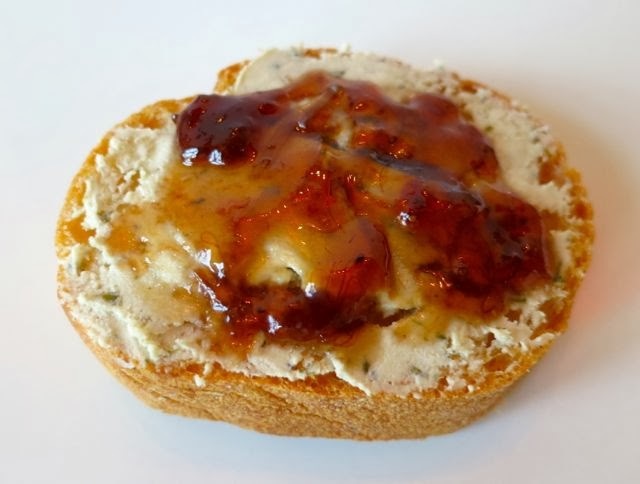 I also tried it on a baguette topped with strawberry rhubarb jam. Magnifique! But, by far, the best way I tried the cheese was on toasted sprouted wheat bread with heirloom tomatoes. The cheese and tomatoes complemented each other so well. It was scrumptious. I'll post that recipe soon. But, the most fun I had this week was bringing that cheese to a potluck full of non-vegans and watching their reaction to eating cashew cheese. They loved it! 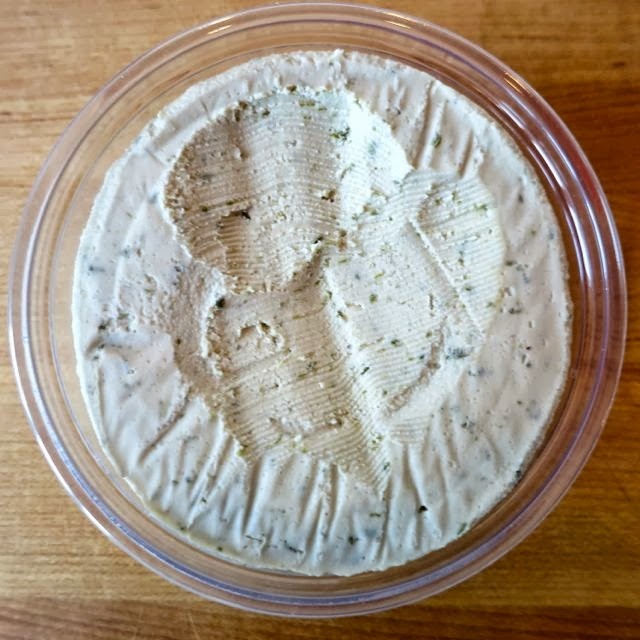 One guy said that dairy cheese doesn't really taste like anything, but this -- with it's subtle herb taste is great. He wanted to know where he could get some for himself. Win! So what is in the cheese? The Herb-Garlic is made of cashew nuts, filtered water, acidophilus, dried scallions, sea salt, lemon juice, white pepper, garlic and onion powders, dried parsley, basil, and oregano. The Scallion flavor is made of cashew nuts, filtered water, acidophilus, dried scallions, sea salt, onion powder, and lemon juice. So they are quite similar. Treeline is working hard on their distribution and will be in stores near you soon. In Maryland, they will be carried at all MOM's markets. In DC, they can be found at Rodman's. They retail for around $7.99 per package. In other news, their hard cheeses in cracked pepper and classic smoky flavors will be in stores later this year as well. I had the pleasure of trying the hard cheeses too and let's just say that they were darned good. Look for a review of those cheeses in the near future. For now, get ready to try one of the finest vegan cheeses yet. For those who say they can't go vegan because they like cheese too much, well, now you can because you'll love this cheese even more and with no cholesterol, it'll be the solution for people who want to have their cheese and eat it too. I hope this comes to Ontario, Canada soon! It sounds so wonderful!